If you’ve been following me on Instagram, you’ll know how we’ve been doing a major renovation and redecorating project on our 75+ year old home. It will be worth it when it’s done, but I can’t say it hasn’t been entirely without stress! One thing I have encountered is the inability to find certain specific items I’m looking for online. We live in a very small community so I rely A LOT on online shopping to find exactly what I’m looking for and at a good price! I’ve noticed simply googling what I’m looking for has its downfalls. First of all, Google mainly shows only the top retailers in its search results pretty much for everything I had been searching for. Don’t get me wrong, there’s nothing wrong with these retailers, but if you are looking for selection and something more unique, Google isn’t that effective. This is exactly why HomeGardenDirectory.com is perfect for me. It’s a directory of over 1,100 small/medium sized independent retailers who offer beautiful and high quality home & garden products. Many of the shops may be new to you and others you may have heard of because they have been featured in top Interior Design magazines. Either way, you can count on finding quality retailers handpicked for this awesome directory. New retailers are added weekly so there’s always something fresh and exciting to be found. Since these retailers are smaller and less well-known than the big box stores, you will have a MUCH harder time finding them through search engines. 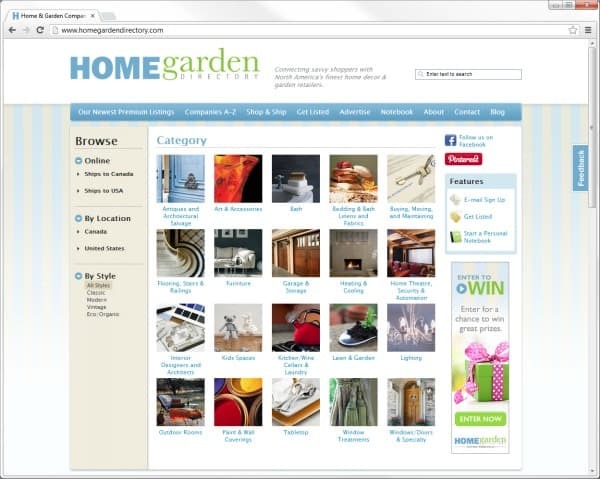 HomeGardenDirectory.com takes out that extra work for you in searching and puts all these small/medium sized retailers in an organized and visually appealing space. The fact that it saves me time from not having to scour the web is a HUGE plus! HomeGardenDirectory.com is geared towards consumers in North America. When you land on their homepage, you will see “Browse” on their left sidebar. You can drilldown to Ships to Canada, USA as well as by Location (Canada, USA). Being a Canadian, this is awesome! I don’t have to check the shipping policies at each individual site because I’ll only be shown results that I can actually shop at. You don’t know how many times before I’ve filled my cart with items only to discover that the store will not ship to me. It’s very frustrating! However, if I did come a cross a product I love and want and discover that they only ship to US, I can still buy it. HomeGardenDirectory.com has partnered with MyUS.com to offer international shipping to over 225 countries including Canada. In addition, you can also search by Style including Classic, Modern, Vintage and Eco/Organic. My style is more modern so I would look for shops with products that will suit the look I’m trying to achieve. On the top menu, you can check out the new listings on the directory. You can also search the shops on the directory from A-Z. So where to start! On the homepage you can see all the categories to find what you are looking for. Right now, I’m on the hunt for the perfect bedding for our master bedroom. We need to pick this out before we buy our paint colours. I clicked on the Bedding & Bath Linens and Fabrics Category. From there, I can specify what I’m looking for. I’m looking for a comforter set so I clicked Comforters, Duvets and Duvet Covers. I’m shown 20 results. The first ones I check out are the Canadian ones like their listing for SelectBedBath.ca. This is a site that is EXACTLY what I was looking for! It’s Canadian and has free shipping plus it has a large selection of bedding in styles I would never find in a local store in my area. I also would have probably not come across this site on Google without really making an effort to find it. See why HomeGardenDirectory.com is so darn cool? There’s also the Notebook! This handy tool lets you easily store the shops you love as you are browsing the directory. It is linked to the IP on your computer so anytime you visit the site it will remember your favourites. Adding a shop to your Notebook is easy. Just click the Notebook icon in the listing and you are done. HomeGardenDirectory.com also has a blog with helpful home decor & garden tips. Their most recent entry is Top 3 Essentials for Your Baby’s Nursery. I enjoyed reading Edible Gardening A Hot New Trend where I learned the basics of vegetable gardening. I’ve always wanted to grow my own veggies! I encourage you to check out Home Garden Directory and discover new home decor & garden retailers. I’ve already added it to my bookmarks and will be visiting it often as we continue on with redecorating our home! Connect with Home Garden Directory on Facebook, Pinterest and their blog. How cool! I could spend hours searching through places like that just for fun! Okay ~ it is definitely time for me to get with the program and update to a smartphone. I want instagram too! What a wonderful app. I could then be able to follow you too!! Thanks for the push! Same situation here I live in a very rural area and do most of my shopping online I have bookmarked this and will peruse it more later today. Oh wow! What a VERY VERY VERY valuable site to have on hand!! Looks like a neat site, will check it out! Thanks for sharing it.